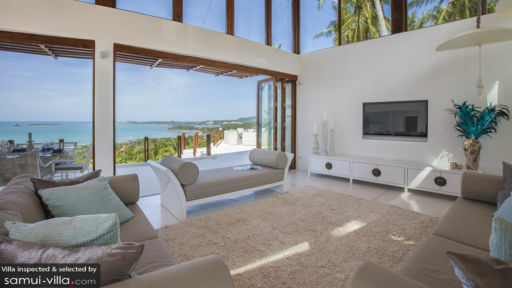 On the beautiful island of Samui, atop the Bo Phut hillside, Villa White Phoenix is a four-bedroom holiday home offering peaceful surroundings, state-of-the-art facilities, and a stunning view spanning miles of lush, tropical vegetation and the sparkling ocean in the distance. From the comforts of your home, you can enjoy the panoramic vista while you lounge in the infinity-edge swimming pool. With a drink in hand, sunscreen on point, and swimsuits in order, enjoy a relaxing and rejuvenating holiday with family and friends! Villa White Phoenix is home to four, fully-furnished and expansive bedrooms with air-conditioning. Each bedroom is designed with a minimal style, and still adopting an Asian décor. The simple aesthetics truly relax your mind as you sleep on the king-sized beds, or relax on the window seats cushioned to perfection. The large glass windows and sliding glass doors, offer a remarkable view to the guests at all times of the day. The terrace outside the bedrooms is furnished with round, rattan seats for your morning or evening tea. All the bedrooms come with en-suite bathrooms that are spacious and the master bathroom has a freestanding terrazzo bathtub with an overhead chandelier. The villa has been designed with curvaceous verandahs with moon-shaped furniture from where you can truly experience the paradise that is Samui. The moon terraces are great for when you wish to enjoy the sunset while you wine and dine with loved ones. A three-tier freeform swimming pool sports an infinity edge, so that you can relish the view that is spread across acres of land and water to allow you to enjoy yourselves. Comfortable seating, mesmerizing surroundings, the calm ambiance, and a few of your beloved people is all you need for an excellent holiday. The pool is accompanied by a swim-up bar, where you can get your drinks, or lounge on the sun chairs and bean bags as you sunbathe! The contemporary living space is designed with an open-concept to maximize on the excellent location and ensure that you get the best of everything. It has been furnished with comfortable couches and coffee tables for a restful and relaxing time, simply lounging and lying back as you chat with your friends and family, catch up on some reading, or watch television. With gray-colored couches and teal cushions the vibrant and cheerful area is ideal for napping, getting together with everyone and spending some time. There are high-windows at the top for natural lighting as well. The dining area is found on the terrace with an eight-seater dining table overlooking the gorgeous scenery sprawling below. A lavish, state-of-the-art kitchen with an open concept and modern appliances is at your disposal, and just as an extension of it is an open-air sitting area where you can lounge and enjoy a snack. The excellent staff at Villa White Phoenix is ready to offer their services to make your stay a memorable experience. They will prepare a daily breakfast to start off your day with a bang! At extra cost, you can request for babysitters, or even request the chef to prepare a lunch or dinner exclusively for you! In-house massages can also be prepared for you by the staff. Housekeeping and maintenance is also taken care of so you have nothing to worry about. The villa is close to Big Buddha beach, so all you need to do is walk down and enjoy the golden sand and dip your toes in the water! Try out the Eco Safari Tour for a fun day out as you trek on elephants, indulge in jeep safaris, and ride on ox-carts! There are many restaurants offering delicious food like Namu, Full Moon Restaurant and others! I participated in a Yogarden yoga retreat at Villa Kya in October. The villa is the perfect combination of luxury and comfort! The other participants and I each had our own suites for privacy while the living areas were ideal for a variety of group gatherings. There was space to enough to do our own thing or spend time together . We were so well cared for by Jeab, the house manager, and her staff that we didn't even leave the property. Brunch was served in the poolside dining cabana and the staff kept the outdoor kitchen stocked with fresh coconuts to refresh us after yoga sessions or if we were having an afternoon by the two-tiered infinity pool. Afternoon and evening lessons/meals were held in the open air living area or on the moon deck. 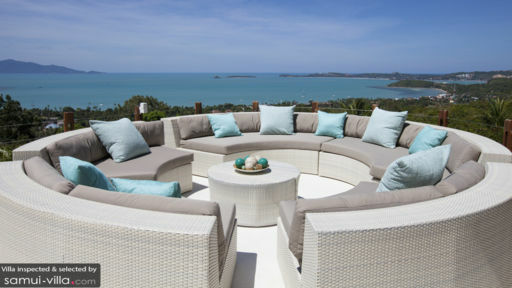 Villa Kya is situated on a high hill which is secluded and quiet while offering spectacular views both day and night. The house overlooks neighboring Koh Phanang as well as the seaside villages of Mae Nam and Bophut. Some nights we were treated to fireworks displays and we were also lucky enough to be there during a full moon. I would recommend Villa Kya to anyone looking for a luxury retreat in a tropical paradise. Villa Kya is where luxury meets escapism. Nestled among the hillside of Boput, Villa Kya is a four bedroom designer villa that provides an unforgettable stay and is sure to exceed all expectations. After recently staying at Kya, we were most impressed with the unparalleled ocean views, the privacy of the villa and the multiple amenities and services offered. It has multiple lounge areas, which allow for peace and relaxation among the lush surroundings, in addition a large infinity swimming pool overlooking the glistening seaside. The staff are extremely hospitable the manager, Jaeb making any request seem effortless. The villa is in close proximity to Fisherman’s Village (a cosy shopping strip with an array of restaurants), which is perfect for evening seaside dining. The only downside is that commuting to and from the villa needs to be arranged with villa staff as most taxis will not drop off directly at Kya due to it being situated on a steep hill. The villa staff are more than helpful with arranging private transfers to and from the villa for outings etc, however please note that this comes at a set price. I have no hesitation in recommending Kya to friends, family and other travellers as you will be sure to have a peaceful, relaxing and enjoyable stay that will leave you basking in the privacy and luxury of it all. As a group of 8 adults and 2 children, we stayed at this villa for 1 week. We were celebrating a honeymoon and a “big” birthday as a family. From the start Krystyna’s communication was excellent, every concern was allayed and every query was answered. After a long hot flight we were met at the airport by their taxi, and taken to the Villa, which totally blew us away. Usually the photographs of properties make them look better than they really are – but not in this case! The actual experience and the amazing views from this Villa are truly better in real life than the pictures. Jeab is the House manager, and she is a darling. Nothing was too much trouble – and she was able to arrange all manner of strange requests with a beautiful big smile, even giving us her personal mobile to use on occasion! Highly recommend the chef services too – we feasted on delicious fresh Thai food for much less than we would have paid for the equivalent standard in the village. Every single detail in the villa has been carefully thought out, and we just loved the good sound system (even around the pool), and waking up in the morning to find that the housework fairies had magically been was wonderful, not only had they tidied everything up – but made a delicious breakfast and set it out ready, they even laid clean fluffy towels out on the daybeds ready for us. Just Bliss. We lived like Rock Stars for the week, and really never wanted to leave. If you want a rental property with true wow factor, yet friendly and accommodating – here it is. Krystyna, Jeab and her team have created something very special indeed. Villa Kya can only be described in one word.. amazing. Everything about this place met up to its expectations and there was not a single negative thing about this place. The villa itself was beautiful and our family had never seen anything like it. We had great privacy and a large backyard with amazing views that spilled over the warm infinity pool. My family spent a lot of time at the villa just because it was too amazing to leave! The service of Jeab and her team was also great. The house was constantly clean and we were always refreshed with drinks, fruit, and a selection of breakfast every day. They were very friendly and welcomed our family with opened arms, in which we created a great friendship with. The facilities of this villa were also great and came to good use. The only minor downfall of this villa was the very steep road and driveway, however it did not effect our holiday whatsoever so it didnt matter! (was just very steep to drive up and especially walk!) Overall we had an exceptional holiday and would absolutely love to come back to Villa Kya.